It was Amy Mucha’s love for koalas that drew her into the baking business. Knowing that Mucha is obsessed with the animal, her mother-in-law bought her a book on how to make cake pops for Christmas in 2011—simply based on the fact the book had instructions on how to make koala cake pops. By 2016, Mucha, a high school math teacher at Cuyahoga Christian Valley Academy in Cuyahoga Falls, had mastered the koala cake pop and tried her hand at turkey cake pops for her students and friends on Thanksgiving. Their popularity spurred Mucha to launch Daisy Cakes (named after her two-year-old daughter, Daisy) in 2018 as a part-time endeavor out of her Kent home. “A lot of people like cake pops,” Mucha observes. “It’s a side hustle that’s really been more than a side hustle." 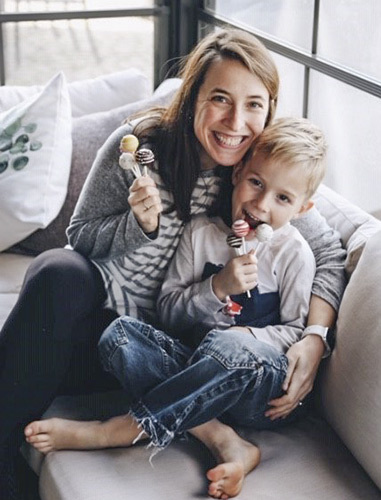 Officially in business for less than a year, Mucha sold 13,000 pops in her first nine months last year and has already made 3,300 pops in 2019—averaging about 400 pops a week. Mucha says kids and adults alike enjoy her pops, in part because of their petite portion size. Each of her pops are individually wrapped, making them the ideal snack or party favor. “Three to four pops equal one large piece of cake,” she explains. Today, Mucha offers more than 20 varieties of pops, as well as gluten-free and allergen-free varieties, in just about every animal, character and holiday theme imaginable. Additionally, she takes special orders and large orders for special events. “Holiday pops are the most fun," says Mucha, adding that unicorn pops are her most popular variety. To accommodate demand, Mucha has converted her basement into a full working kitchen—enabling her to not only make up to 1,000 pops for a single event (she made 1,200 pops for an auction at her school last year), but to also keep a supply of around 500 “stock pops” in four freezers for on-the-fly orders. “If I’m home, people can get them within an hour,” she says, adding that her pops are non-perishable and defrost quickly. Mucha employs a few of her former students and neighbors to help her make and distribute the pops. Up until now, she has limited her business to pickup orders from both her Kent home and her mom’s house in Parma, as well as selling at the Kent Farmers Market and offering local delivery of larger orders. Currently, Mucha is looking for a Cleveland pickup location and will deliver orders of $50 or more for a fee. In the meantime, Daisy Cakes was accepted to sell at the seventh Cleveland Flea season beginning Saturday and Sunday, May 4 and 5 at Tyler Village (3615 Superior Ave. East in AsiaTown). Mucha sold her pops at the Flea last October, displaying them in a makeshift display case crafted out of acrylic sweater drawers from the Container Store. Mucha has also partnered with Mocina Coffee, a start-up farm-to-cup purveyor of Guatemalan coffee, to distribute coffee and cake pops in tandem to local cafes. Mucha and Mocina co-owner Pablo Lopez met in November during a pop-up fashion show held by Yellowcake Shop and immediately hit it off.